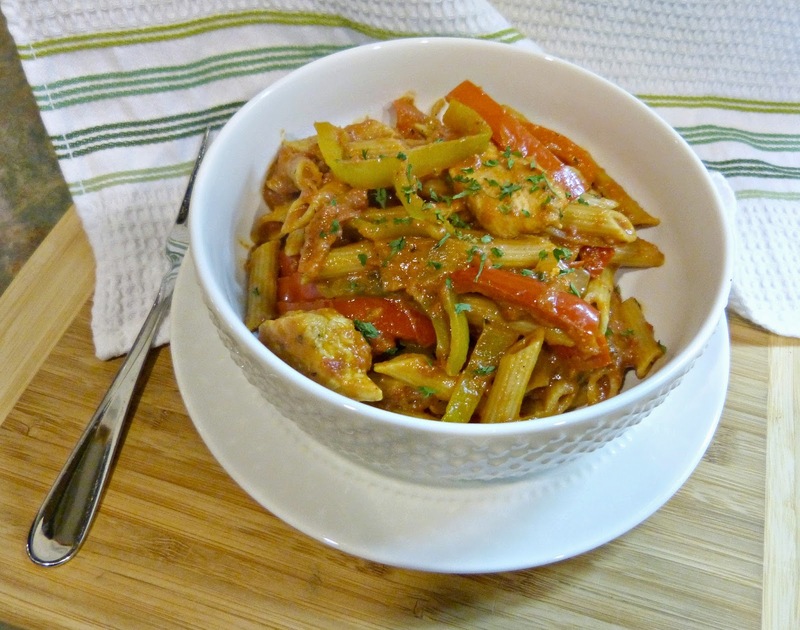 Chicken Riggies may not sound familiar to a lot of you, but if you have ever spent any time in central New York then this pasta dish will take you right back there. I had never heard of this dish before moving to Syracuse for college, but once I got there I started spotting it on menus all over the city. And for good reason: it's delicious. A one sentence fuzzy history lesson: Chicken Riggies was created in Utica, NY sometime in the 1980's and quickly become a popular regional pasta dish with several chefs claiming to have invented it, though its actual origin is unknown. And what is it, you ask? 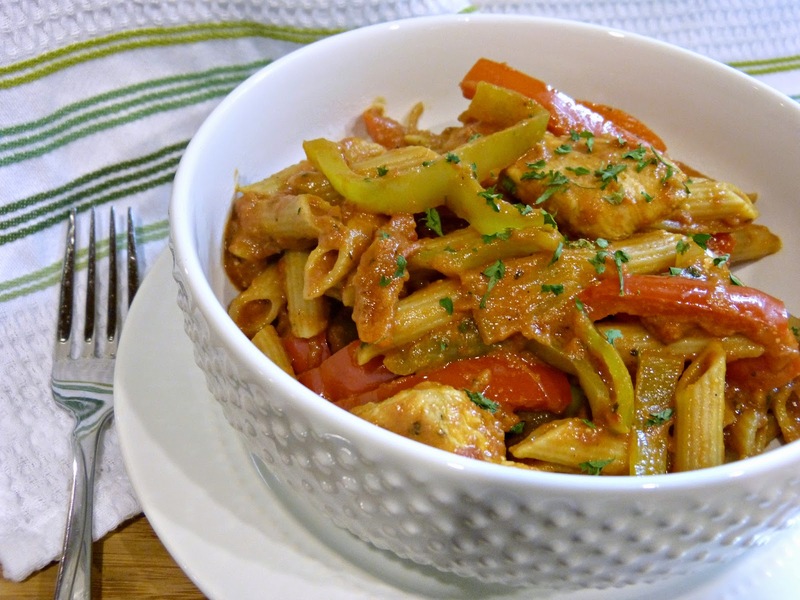 Chicken Riggies is rigatoni pasta, chicken, and a combination of different peppers tossed in a creamy tomato sauce. Typically this dish includes both sweet and spicy peppers and the slightly sweet tomato sauce also packs some serious heat, so there are a lot of great layers of flavor in this fairly simple pasta dish. Not only is Chicken Riggies always really tasty, but it is also super rich-- likely due to the copious amounts of butter and heavy cream you'll find in most restaurant versions of this dish. I try to reserve ingredients like heavy cream for special occasion dishes and not our standard weeknight dinner recipes, so my version of Chicken Riggies is a bit lighter than the norm. A combination of a little butter, fat free Greek yogurt, and 2% milk makes the sauce thick and silky without packing it full of fat. And frankly, the different flavors of all of the peppers in this dish (spicy cubanelles, sweet red bell, and hot and tangy cherry peppers) really shine in this lighter sauce. I also upped the healthy factor here by using whole grain penne. It's not rigatoni, which seems inappropriate given that the dish is called "riggies," but in the name of healthier eating I went for it. Enjoy one of my central New York favorites in your own kitchen this week! 1 lb. whole grain rigatoni *I used penne... do they make whole grain rigatoni? Bring a large pot of salted water to a boil. Cook pasta until al dente and drain, reserving 1/2 cup of pasta water. Season chicken with salt, pepper, and garlic powder. Heat 1 Tbs. olive oil in a large saute pan. Add chicken to the pan and saute until golden brown on both sides. Transfer chicken to a plate and set aside. Add the remaining oil to the pan and stir in garlic. Cook for one minutes, stirring constantly. Add in onions and peppers and saute for 6-8 minutes until vegetables begin to soften. Pour in sherry to deglaze the pan, scraping up any browned bits from the bottom of the pan. Add crushed tomatoes, pepper flakes, sugar, butter, and yogurt to the pan. Stir to combine and allow to simmer for 15 minutes, stirring occasionally. Stir the milk into the pan and cook for another 10 minutes. Season with basil and parsley and add chicken back to the mixture. Fold pasta into the sauce and add reserved pasta water. Simmer for another 5 minutes until the chicken is heated through and the pasta is tender. Serve warm with grated Parmesan. Loosely based on recipe by Julia's Child. Looking for something similar? Try Penne with Chicken Sausage, Roasted Zucchini, & Red Pepper Pesto or Linguine with Roasted Chicken Breast & Broccolini!